1. 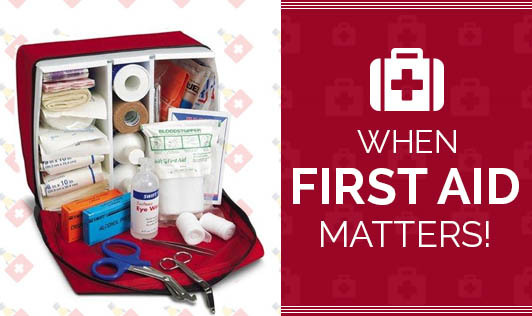 Keep a first aid kit at an easily accessible location at home or work. It should be accessible to all. Make sure it has the basic medicines and supplies. 2. Make sure the first aid kit along with all the medications and instruments are out of children's reach. 3. Before you begin, assess the environment. Protect yourself from blood and body fluids with a pair of gloves. Unconscious victim: If the victim is unconscious, perform rescue breathing. If the victim's heart has stopped beating, perform cardiopulmonary resuscitation (CPR)if you have been properly trained to do so. Shock: Shock is an outcome of severe injury or emotional upset. The victim's skin generally turns pale and cold. Confusion, frequent vomiting, nausea and shallow breathing are other signs. Have the victim lie down on a flat surface with legs elevated. Cover him to keep him warm and prevent loss of heat from the body. If the victim can swallow, give him some fluids. Bleeding: Protect your hands with gloves or a clean plastic bag if nothing else is available. Use your finger, hand, a thick pad of cloth or a bandage to press the wound hard to control bleeding. You could use a strip of cloth to tie this up tightly. Take care not to stop circulation to the rest of the limb. Hold the bleeding wound at a higher elevation. Burns and Scalds: In this situation, immerse the burned area immediately in tap or cool water or apply clean, cool, moist towels. Do not use ice or break blisters because it may cause further damage to the burned area. If possible, remove the victim's clothing. Clothes stuck to the wound can remain. Get medical help as soon as possible. Spinal Injuries: An injury to the spine could be dangerous and permanent. Do not move the limbs or body of the victim unless it is absolutely necessary. If he/she needs to be moved, keep the torso and neck as straight as possible and pull in a direction that keeps the victim's spine straight. You could pull from the feet or shoulders, or pull him by his collar. If the victim is face down, turn him on his back by rolling his torso and neck together to open his airway. No twisting should occur. Once you have his breathing monitored, get help! Eye injuries: All eye injuries need immediate attention. Wash your eyes well with clean water or sterile fluid to remove loose material. If there is any embedded material, do not attempt to remove it. Keep a pad on the victim's injured eye and get to the hospital right away.